I designed this nursery for my niece. When it came to the overall look, both my sister-in-law and I decided that we didn't want a “themed” nursery. Instead, we preferred a room that felt soft, serene, feminine and glamorous with touches of gold. Most importantly, it needed to be on budget! It took a while with many shopping trips, but when all said and done I was so happy with the way it turned out! We found a picture of a gold crown in the Restoration Hardware catalogue. Although the crown was out of our budget, we knew that we wanted it to feel regal and glamorous. I love easy, multi functional pieces that can work from room to room. I like practical fabrics that withstand almost anything and natural finishes and textures. I love the rocking chair. It was a $40.00 Kijiji find that we had reupholstered for $300.00. It's super cozy, cute and the perfect size for the room. The look of the room is monochromatic. I just pulled different shades of pink, peach and gold. Somehow it all worked. So pretty! 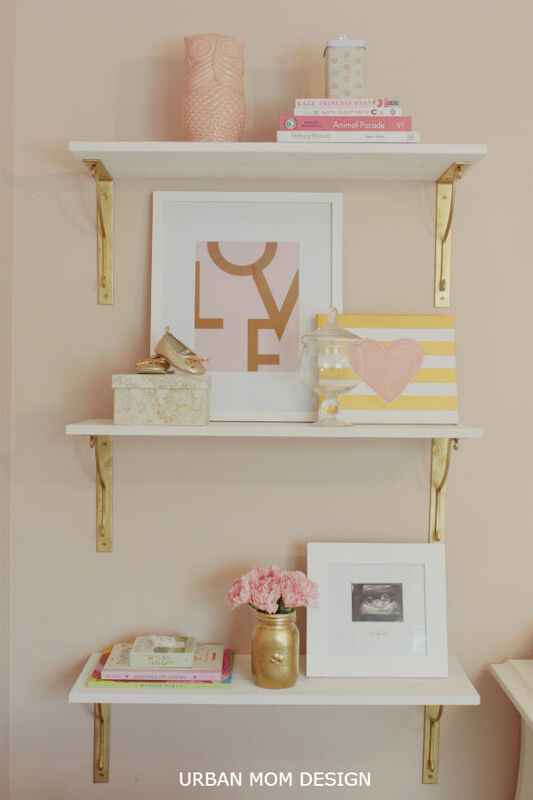 I love the touches of gold and the closet with the gold hearts. Could you please tell me what the paint color is on the walls? Love it! Beautiful! Peach and gold is so pretty together. I really love the gold letters above the crib. And the adorable dot fabric on that glider makes it so unique. Enjoy this special nursery. What a beautiful room! I love the shape of the crib, can you tell me where it is from? Would love to know the name of the paint color, too. It’s perfect! Where are the shelves from? I love the gold! What is the paint color?! Another plea for the name of the paint color! I love it! Did a great job with the room!! Would also LOVE to know the paint color. Looking for that same shade!!! love all of the white furniture, where are the crib and dresser from? My daughter-in-law fell in love with the crib,Please tell me where you purchased it. The whole room is beautiful.. I would love to know the paint color please!!! Can you tell me where the crib is from? Adorable! Love this look! Could you tell me where you to the frame and letters for the monogram above crib? Thanks! What color are the walls in that bedroom? I am looking for a pretty neutral! Where did you find the crib bedding? Didn’t see this answered yet, but was hoping maybe it was because you emailed the ladies individually; what is the name of the crib (and matching furniture)? I am absolutely in love! Found a great piece that SORT OF looks like it, but would LOVE to have this exact one! -Thanks! Hi Cate, Looks like it’s the Bergamo collection from Pali. Have fun designing your nursery! I’m terrible at picking paint colors and love the color you chose for this nursery. I’m due with a baby girl in October and would love to try this paint color out on her walls. Thank you! Amazing room. So very creative. Thank you for sharing. We are adopting our angel and she comes home in July. I would love to paint her room this color if you care to share it.? Thank you. i love the paint color can you tell me what the name is and where it’s from please?? I see a crib on your Pinterest page that my daughter loves. I cannot find it on this site. Its called A Glamorous Nursery for Clara. Can you direct me to where I can get it. Hi Jeri, You can see in a comment below where I linked to the crib used in this nursery. I love the wall color. Please let me know what paint color was used. I’d love to use this for my little girls room. Hi, what color paint is that? It’s gorgeous! What is the size of the frame you have the letters in above the crib? Love it! What color paint is this and where can I find? Love these shelves, can you tell me where you bought them? Can you tell me where the shelves and the monogram letters are from? Also what paint was used to paint gold? Love it! Do you know what size the letters are? I’m wanting the same for my nursery but can’t decide on height wise. Hello can you please tell me where the shelves are from? I would like to know where did you guys get the knobs. I LOVE the “Love” print! Can you tell me where you ordered that? Thanks! I would also love to know the name of the paint color as well as where you found the love print. This is exactly the look I want for my daughter’s room! Can you tell me where you got the crib and dresser from? I loved them! Where did you find these knobs? I love the white and gold shelves! Can you tell me where they are from?